Whoever said you can't make healthy or good food in a microwave?! 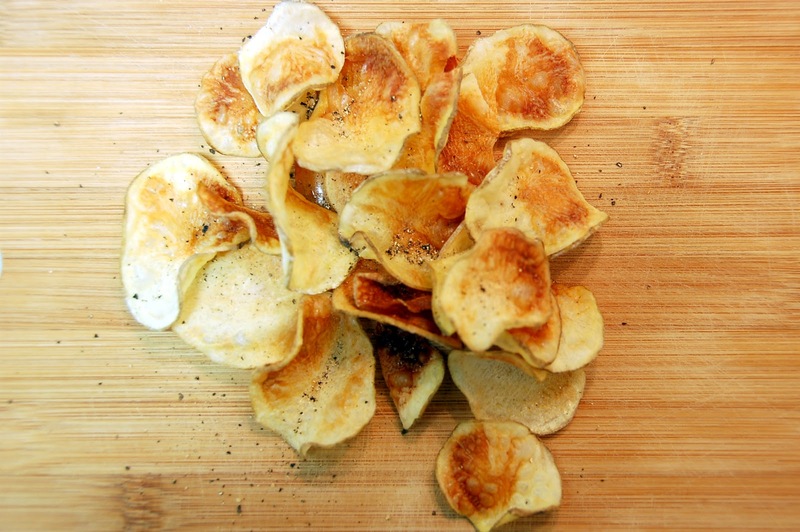 Well food snobs constantly say this, but shoo to them, because with no preservatives and only a touch of salt and pepper, these potato chips are very healthy, crunchy, and taste great by themselves or with a dip. They're also very easy to make; the key is to keep the slices thin by using a mandolin grater, vegetable slicer, or something similar. I personally also used a microwaveable potato chip maker that I bought for HKD25 or so, but there's no need to go down that fancy road. A simple, microwaveable dish sprayed with some cooking oil will do just as good a job. Lining the dish with parchment paper works just as well. Thinly slice 1/2 of a potato at a time and place the slices either in a microwaveable potato chip maker, or place them on a microwaveable plate/bowl lined with parchment paper, or a light brushing of cooking spray/vegetable oil. Lightly sprinkle with a bit of olive oil, salt and pepper if desired. Microwave chips for approximately 8 minutes or until they lightly brown and get a crispy texture. Repeat the process until you've used up all your potatoes or are sick and tired of making them. These can last for ages, so crisp away!